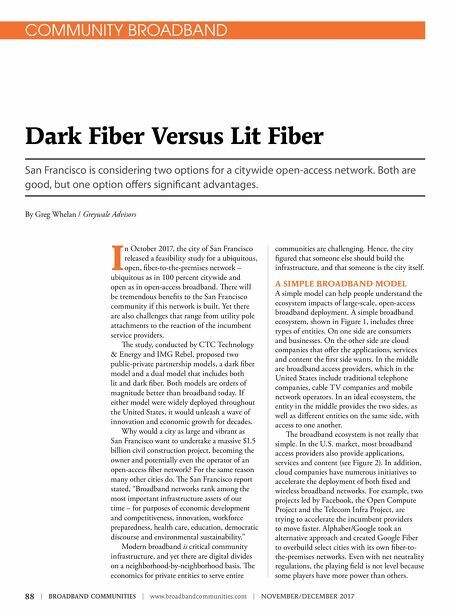 88 | BROADBAND COMMUNITIES | www.broadbandcommunities.com | NOVEMBER/DECEMBER 2017 COMMUNITY BROADBAND Dark Fiber Versus Lit Fiber San Francisco is considering two options for a citywide open-access network. Both are good, but one option offers significant advantages. 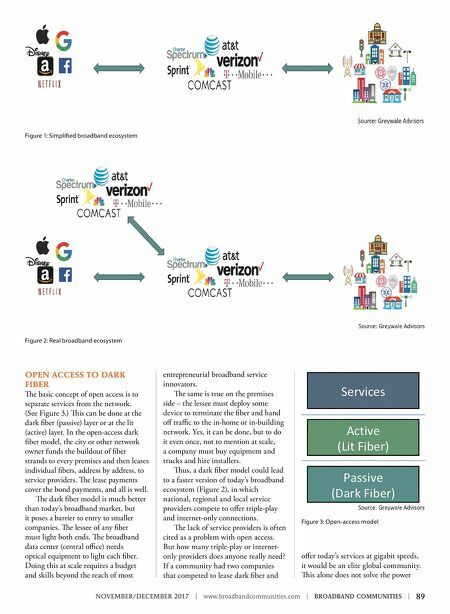 By Greg Whelan / Greywale Advisors I n October 2017, the city of San Francisco released a feasibility study for a ubiquitous, open, fiber-to-the-premises network – ubiquitous as in 100 percent citywide and open as in open-access broadband. ere will be tremendous benefits to the San Francisco community if this network is built. Yet there are also challenges that range from utility pole attachments to the reaction of the incumbent service providers. e study, conducted by CTC Technology & Energy and IMG Rebel, proposed two public-private partnership models, a dark fiber model and a dual model that includes both lit and dark fiber. Both models are orders of magnitude better than broadband today. If either model were widely deployed throughout the United States, it would unleash a wave of innovation and economic growth for decades. Why would a city as large and vibrant as San Francisco want to undertake a massive $1.5 billion civil construction project, becoming the owner and potentially even the operator of an open-access fiber network? For the same reason many other cities do. e San Francisco report stated, "Broadband networks rank among the most important infrastructure assets of our time – for purposes of economic development and competitiveness, innovation, workforce preparedness, health care, education, democratic discourse and environmental sustainability." Modern broadband is critical community infrastructure, and yet there are digital divides on a neighborhood-by-neighborhood basis. e economics for private entities to serve entire communities are challenging. Hence, the city figured that someone else should build the infrastructure, and that someone is the city itself. A SIMPLE BROADBAND MODEL A simple model can help people understand the ecosystem impacts of large-scale, open-access broadband deployment. A simple broadband ecosystem, shown in Figure 1, includes three types of entities. On one side are consumers and businesses. On the other side are cloud companies that offer the applications, services and content the first side wants. In the middle are broadband access providers, which in the United States include traditional telephone companies, cable TV companies and mobile network operators. In an ideal ecosystem, the entity in the middle provides the two sides, as well as different entities on the same side, with access to one another. e broadband ecosystem is not really that simple. In the U.S. market, most broadband access providers also provide applications, services and content (see Figure 2). In addition, cloud companies have numerous initiatives to accelerate the deployment of both fixed and wireless broadband networks. For example, two projects led by Facebook, the Open Compute Project and the Telecom Infra Project, are trying to accelerate the incumbent providers to move faster. Alphabet/Google took an alternative approach and created Google Fiber to overbuild select cities with its own fiber-to- the-premises networks. Even with net neutrality regulations, the playing field is not level because some players have more power than others.